Man:	Sshh, dear, don’t cause a fuss. I’ll have your spam. I love it. I’m having spam spam spam spam spam spam spam beaked beans spam spam spam and spam! It just occurred to me: Terry Gilliam (the non-British actor in Monty Python) is a Minnesotan. 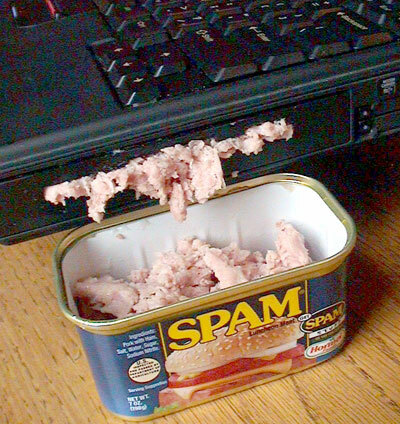 Spam is product of Hormel, and Austin, Minnesota based company. The Vikings are the Football team of Minnesota. and rather new when Gilliam would have been growing up. I can’t believe that that just occurred to me. Also I’ll have spam spam spam ham egg and spam. Its not got much spam in it. who would do this to a computer on purpose? this is what goes through the head of a normal, logical person. Grind equal parts cheddar cheese and span,mix in mayo to taste.Makes a great spread(learned that recipe while I was a trustee in jail many years ago). No thanks, sounds like a recipe only to be used in jail, or Hawaii.